COME PARTY WITH US AT SHELL WE BOUNCE! Our parties will work for any age group or reason to party! 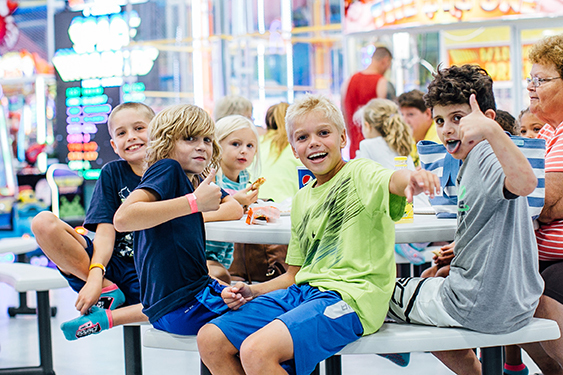 2 Hour Party = 90 minutes of Bounce time (access to all trampoline equipment, as well as Kid Zone) + 30 minutes Private Dodgeball (a Private Dodgeball Court, reserved for just your party!). *This party package is specifically designed for those bouncers who do not need the private eating area, food***, or Arcade cards as part of their package. If you would like the private eating area, food, and Arcade cards, please choose our “Shell We Bounce Party” package. Thank you! ***Food and Beverages may be purchased at our Shell We Eat? Café. Please do not bring in outside food or beverages at all for this party.Thank you! Please note: There is a Shared Party Fee of $30 for each additional Guest of Honor. Begin with our Shell We Bounce party package, add on additional items as needed, and spice up your play time with our Mix & Match add-ons! Upstairs in our Mezzanine ( Great view of entire park) ! **Additional Bouncers $20.00/each: Includes paper products, bounce socks, $5 Arcade Card, and the 1 hour Main Court Bounce Time. ***Additional Food and Beverages may be purchased. Please do not bring in outside food or beverages, other than cake or cupcakes. Thank you! Please Note : There is a Shared Party Fee of $30, in order to designate an additional Guest of Honor. Shell We Bounce offers Field Trips and other Group Events, such as Schools, Corporate Team-Building, Youth Groups, Daycares, and more! Your organization can enjoy bounce time, Arcade play, food from our cafe, or a combination of any of the 3! Rates are based on number of participants as well as length of time. The contact person for your organization can email info@shellwebounce.com or call 302-827-4453 option 0 for more details. FUNDRAISERS - Earn proceeds for your organization! Your organization can host a Bounce Night at Shell We Bounce to raise funds! After the date and time is established, you will advertise your event and bring in as much business as possible. Your attendees will tell us upon payment that they are supporting your organization, and then you will receive 25% of the proceeds from the business you brought in during that timeframe!